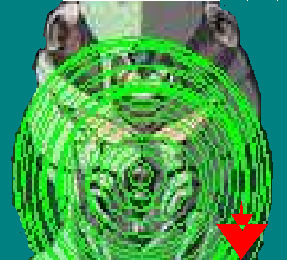 The two silver medallions vertically one on top of one another, where the human mouth would be, are the devices which send out sonic waves. The sonic waves are of high frequency. In the translated video, the sonic waves make the heads of Chronos combatants (assumably Ramotiths) and Gaster's liquid darts explode and the waves gave Derzerb a nose bleed. The Guyvers sonic waves are near the Guyver's inhaling and exhaling vents. It is rare for the sonic waves to be ineffective.